I have been fond of gardening and growing plants, at least as long as I can remember. I was born in in Sweden, but since 2000 I live in Spain, which much warmer climate makes it much more suitable to cultivate some more exotic plants and more specifically palm-trees. Palm trees are members of the family Arecaceae. They grow in hot climates. 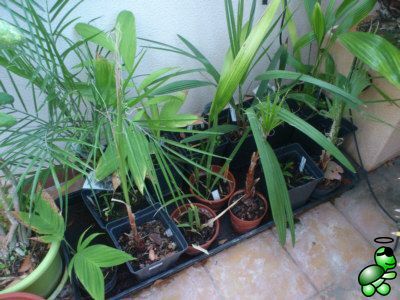 My particular interest in palm-trees has gradually resulted in a small, but growing, collection of various palm-trees, both local species and some species naturally growing outside the Iberian peninsula. Right now, my collection includes some 25 different species, almost all of them driven up from seed and all of them being grown outdoors on my terrace. The winter is fairly mild here, with temperatures seldom dropping below 0ºC during night time (but the real temperature being several degrees higher, due to the heat radiation from the house) and 10-15ºC during day time. The summer is quite a lot hotter, with an typical interday temperature range between 20ºC and 40ºC. Planting palm-tree seeds is similar to planting any seed - there are a lot of recommended instructions on how to get the very best results referring to the seed to plant ration. However, while I do try to plant the seeds during the optimal season of the year and making sure the conditions are as favourable as possible, at the same time I do not believe in an perfect incubator environment for the seeds and early palms. If I expect them to live in the given conditions, the seeds should also germinate and grow in similar conditions. Said that, I nothing makes me happier than a successful seeding and germination. I have tried both purchasing seeds on the Internet as well as picking up seeds from grown-up palm-tree. Close to where I live, s an excellent botanic garden, with a wide assortment of palm-tree from all around the world, so I am fortunate enough to have a reliable source of seeds. I have found (which comes at no surprise) that there is a direct relation between the age and storage conditions of the seeds and the success ration when germinating. While some rare palm-tree seeds can be purchased on the Internet, there is no other possibility than to trust the seller with regards to the harvest time and storage conditions of the seeds. My personal experience is that there is a much higher success ratio using seeds picked up directly at the mother palm-tree. There is also a great satisfaction knowing that your palm-trees have grown from personally selected seeds. Sabal domingensis is a fan palm with solitary, very stout stems, which grows up to 10 metres tall and 60 centimetres in diameter. Plants have 20–30 leaves, each with about 90 leaflets. The inflorescences, which are branched, arching and at least as long as the leaves, bear pear-shaped, black fruit. The fruits are 1–1,4 cm in diameter; fruit size and shape are the main characteristics by which this species differs from Sabal causiarum. 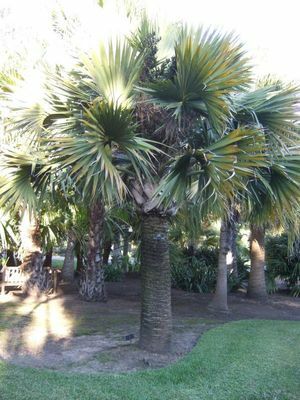 Sabal domingensis is known as the 'Hispaniola palmetto', 'Hispaniola palm', or 'Dominican palm' palma cana in the Dominican Republic and latanier-chapeau in Haiti. Sabal domingensis is found from northwest Haiti to the central Dominican Republic, and is also present in Cuba. It is usually found in secondary vegetation between 100 and 1.000 m above sea level. The leaves are used for thatch and to weave a variety of items including hats, baskets and mats. 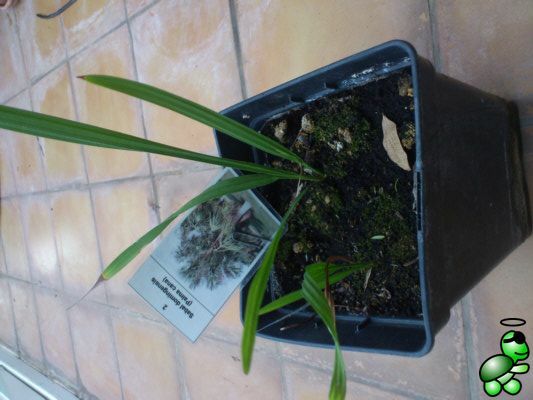 Below you can see photos of the sabal domingensis and the current size of my sabal domingensis palm. This palm is easy to propagate from seed. Germination time is said to be 2 to 6 months, which is line with my own experience. My sabal domingensis palms are now some 20 cm high, and have grown very slowly since they germinated, even during the hot summer period. I hope they are now growing below the surface, and then start to grow faster.